WHY TO CHOOSE EKOL HOSPITALS? 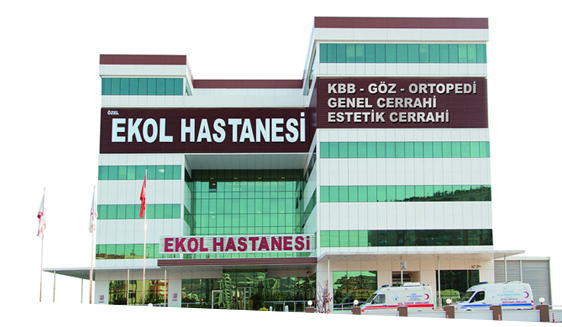 Turkey's first and only Ekol ENT Hospital is unique in Europe, it is an example to the properties owned by the expo. Australian Citizen Summer Norton (33) preferred Ekol ENT Hospital in İzmir after long researches for cosmetic surgery. We have really liked everything. The service, quality and attitude of the personnel. We recommend this clinic as a top class institution. And wish to be the same in future. Everything was perfect. The doctor is amazing, the staff as well. I will recommend this Hospital. Big Thanks !!! My experience at this medical facility was very proffessional and left me feeling that I received the best medicsl treatment avaible. The ease for testing and waiting was very comfortable. Also, I did not feel that the language was a barrier whatsoever. I would highly recommend this facility to my family and friends. I WOULD LIKE TO THANK EVERYBODY ESPECIALLY THE NIGHT NURSE WHO TOOK VERY GOOD CARE OF US 24/7. MADE SURE MY HOSPITAL EXPERCENCE WAS ASSMOTH AS POSSIBLE. THE LOVELY INTERNATIONAL PATIENT SERVICE WHO WAS HARY FRIENDLY. MADE US FEEL EXTREMELLY WELCOMED. COMFORTABLE OUR DOCTOR WAS AMAZING. ASSURED US THROUGHT OUR WHOLE TIME. THANK YOU AGAIN. AMAZİNG HOSPITAL! I WOULDNT HAVE BEEN ABLE TO GO AHEAD WITH MY OPERATION IF IT WASNT FOR THEM. THE PEOPLE HERE AT EKOL ARE VERY NICE. THE DAY AND NIGHT NURSE WAS VERY HELPFULL. THE SURGEAN WAS VERY REASSURING AND LOVELY. INTERNATIONAL PATIENT SERVICE WAS HELPFULL AND LATERED TO MY EVERY REED AND ANSWERED MY QUESTION. MOST STAFF WERE VERY GOOD, TOOK GOOD CARE OF US. INTERNATIONAL PATIENT SERVICE WAS ALWAYS AVAILABLE AND WENT OUT OF HER WAY TO ENSURE MY COMFORT BEFORE, AFTER SURGERY. NURSE AND INTERNATIONAL PATIENT SERVICE WERE SO HELPFUL ORGANIZED AND SO GOOD TO ME. THEY WAS 24/7 REACHABLE, THEY HELPED AND SUPPORTED ME A LOT! EVERYTHING IS SOO GOOD ABOUT THIS HOSPITAL. TO WILL NOT HESITATE TO RECOMMEND IT TO ANYONE NEED OF THIS SERVICE. WE ARE VERY MUCH SATISFIED, WE WILL RECOMEND THE HOSPITAL FOR SURE. IN TOTAL WE ARE VERY HAPPY VISITING YOUR HOSPITAL. GREAT SERVICE, GREAT ENGLISH SPEAKİNG DOCTOR, PROVIDED FLUENT ENGLISH SPEAKING STAFF TO ASSIST WITH TRANSLATION. THEY HAD ALL THE EQUIPMENT NEEDED FOR A FULL AUDIOLOGY TEAM, INCLUDING ENGLISH WORD COMPREHENSION. I HIGHLY RECOMMEND IT. My experience at this medical facility was very Professional and left me feeling that I recieved the best medical treatment available. The aese for testing and waiting was very comfortable. Also, ı did not feel that the language was abarrier what so ever. I would highly recommend this facility to my family and friends. Feel free to contact us here, call us or email us! We will be getting in touch with you shortly for a better assitance about your requests!